Burial at Sea services are pending for Robert F. Crews of Tucson, Ariz., formerly of Cheyenne, Wyo. Robert passed away Aug. 15, 2017, at the VA Center in Roseburg, Ore., at the age of 94. Robert is survived by his wife of 72 years, Adele, daughter Diane Weber of Seattle, Wash., sons Robert Jr. (Susan) Crews of Umpqua, Ore., Jerry (Dena) Crews of Chadron and daughter-in-law Debbie Crews of Rock Springs, Wyo. Robert was born Dec. 18, 1922, in Cheyenne, Wyo., to Ralph and Mabel Crews. 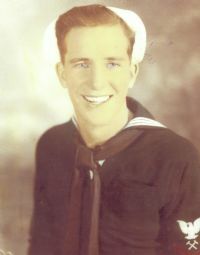 Robert graduated from Cheyenne High School in 1942 and enlisted in the U.S. Navy. He trained as a LST (Troop Transport Beach Landing Craft) pilot and saw heavy combat in the Atlantic and Pacific. In 1945, he married Adele Leto of New Orleans, La., and of this union four children were born: Diane, Robert Jr., John and Jerry. After WWII, he continued his military service by enlisting in the Wyoming Air National Guard. In 1949, during the blizzard, he served by dropping hay to stranded livestock in the region. During the Korean and Vietnam Wars, he served as flight engineer, flying transports. On one occasion, flying over the Sea of Japan, the plane lost three of the four engines. Asked by a young serviceman from Wyoming what do, Robert replied, â€œRepeat after me, â€˜Our Father who art.â€™â€ Those prayers were answered. After retiring from the Air National Guard in 1966, he started a successful service station business in Cheyenne. Always the sportsman, Robert enjoyed hunting, golfing and coaching, but his greatest joy was coaching his sonsâ€™ little league baseball teams and watching his daughter cheerleading at sporting events. He also served as baseball commissioner for the Little League System in Cheyenne. On one successful moose hunting trip near Jackson, Wyo., he bagged a moose that dressed out so much meat that the family became so tiresome of eating moose they had to give the rest away. A devoted member of the Catholic Church, Robert became a fourth degree member of the Knights of Columbus and served as Grand Knight for several years. He was instrumental in establishing the Knights of Columbus Council in Gillette, Wyo. After selling his businesses and retiring from the Wyoming Air Guard, he became a Knights of Columbus insurance agent, serving Knights in both Wyoming and Louisiana. Then in 1985, Robert and Adele retired to Tucson, Ariz., where they enjoyed golfing and senior activities for many years. Robert was proceeded in death by his son, John, in 1990.